Check out our all NCAA tournament betting analysis here in our blog. After a hot start in betting on the tournament, we cooled off a bit last weekend. We are now 8-6 on betting on the tournament. After looking at the numbers, the spreads and O/U for both games seem to be right on point. For Virginia vs. Auburn, the line moved from Virginia -5.5 to -6. For Michigan State vs. Texas Tech, the line moved from Michigan State -2.5 to -2. 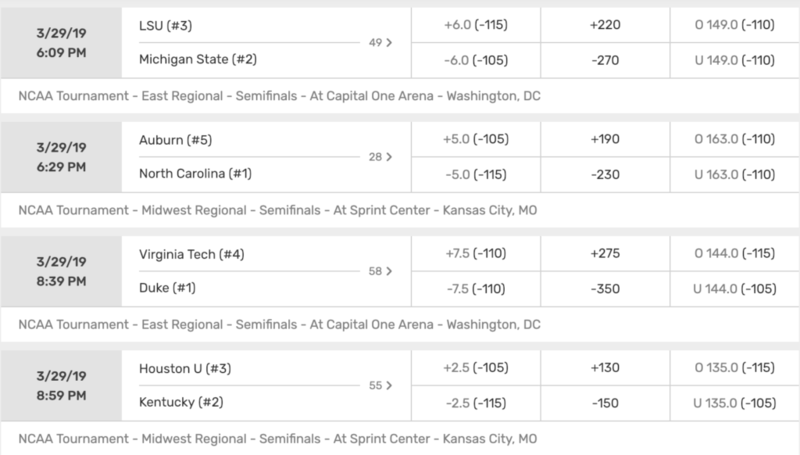 However, there are two NCAA Final Four prop bets which we find very intriguing. Both happen to be on the Virginia vs. Auburn matchup. This number seems low because Virginia is a great defense against the three. However, so far in this tournament, opposing teams have been shooting a lot of 3s against the vaunted Virginia defense. When they played Purdue, a team in the top 50 in 3PT FG attempts as a percentage of total FG attempts, Virginia allowed 14 made threes. Over the regular season, Auburn placed in the top 10 in this category with just under 50% of their total FG attempts from 3. And as you know, Auburn has the hottest offense of all the remaining teams in the Final Four. They made at least ten threes in all their games in the tournament except for their Elite Eight matchup against Kentucky. On the other end, Auburn allows a lot of three point attempts as well. They were outside the top 300 in this category as a percentage of total FG attempts. While Virginia hasn’t shot the three as well in the tournament as in the regular season, they should get plenty of opportunities. We project twenty combined made threes in this matchup and like the over. At first glance, these two bets seem a little contradictory. But we like the percentage of likeliness that at least one of these, if not both, will happen. One thing that has long been a liability for Virginia’s slower style of offense is that the Cavaliers struggle to separate against quality opponents. Auburn will be no different barring a complete no show from three point land. However, Virginia’s efficiency on both ends of the floor doesn’t allow them to go down by a big lead either. We see both teams trading punches throughout the game, and the final result will end close instead one team landing a knockout punch early. Best of luck to all those betting on the NCAA Final Four! Want to keep the conversation going, or simply talk crap to us? Follow us on Facebook, Twitter, and Instagram. Special thanks to @matteise for compiling the data used in this analysis. Check out our all first round analysis here in our blog. What a great first weekend for the NCAA Tournament. 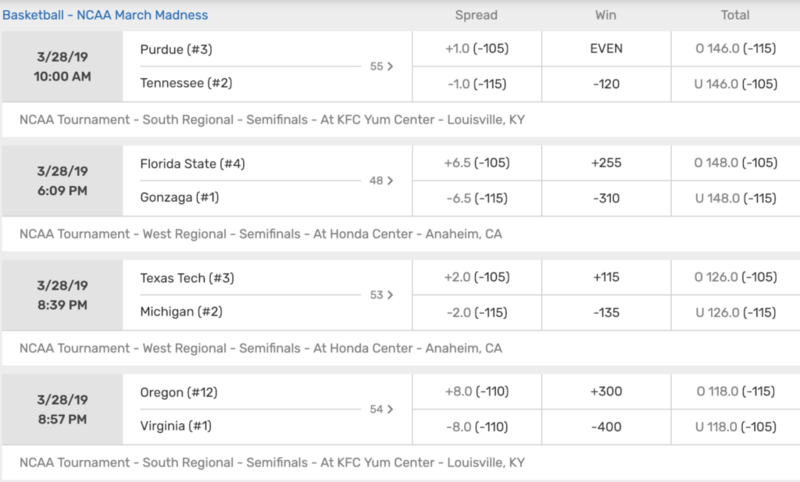 Now that the dust has settled, how did everyone do in their sports bets on March Madness? Here’s a roundup of our tweets from the first weekend. We ended up going 8-4 on the weekend. We went 5-2 on the first two days. This was one of the few bets we got very wrong. We bet Michigan State -10. They beat MN by 20. Houston proved us right and beat Ohio State by 15. Now, let’s take a look at the Sweet 16 matchups. From 2015-2018, the #1 Seeds are 10-1-1 ATS. Virginia is favored by 8 points, and Duke opened as an 8 point favorite. When the #1 Seed is favored by 8 or more points, the #1 Seed is 7-1 straight up and 5-3 ATS from 2010-2018. North Carolina vs. Auburn is the lone matchup with an O/U over 150. If there’s a game with a #1 Seed and the O/U is set at 150 or higher, the #1 Seed is 12-1 straight up, 9-2-2 ATS, and the O/U is 9-3-1.
under 10 points (2013 Louisville 77 – Oregon 69). This gives us something to think about for the Virginia/Oregon matchup. Starting in 2015, in #1/#5 matchups, the #1 Seed is 6-0 straight up, including four victories by double digits. From 2015-2018, in #2/#3 matchups, the #2 Seed is 3-1 straight up. All four games had a double-digit point differential. When the #2 Seed plays in a Sweet 16 game where the O/U is set at 140 or higher, the last six have gone under. Tennessee/Purdue & Michigan State/LSU matchups have a O/U above 140. In the #2/#3 matchup, when the #2 Seed leads at the half, the #2 Seed is 7-0 S/U and 7-0 ATS. We’re already in on betting Virginia -8 and North Carolina -5. Oregon made it to the Sweet 16 on the strength of their defense and their 3PT shooting. However, facing a Virginia offense ranked #2 in the country in adjusted offensive efficiency will be a lot tougher to defend than Wisconsin (#52) or UC-Irvine (#125). Oregon did well to hold both Wisconsin and UC-Irvine to under 30% from downtown, but Virginia comes in ranked #4 in the country in 3PT % at over 40%. Also, Kyle Guy, leading scorer for Virginia, went only 2-15 shooting in Virginia’s win Sunday over Oklahoma, which possesses a top-25 defense. But the Cavaliers still managed to secure a 63-51 win. So Virginia can win comfortably even when their leading scorer has an off game. Conversely, while Oregon has shot 50% from 3 so far this tournament, their season average is 34%, good for #171 in the country. Guess what Virginia is ranked in terms of defending the 3? Top in the country. Thus, we expect a regression to the mean on offense for Oregon and for Virginia to win by double digits. Rebounding per possession – In games that Virginia lost, they were out-rebounded by approximately 6 rebounds on average. Per possession, Virginia is a better offensive and defensive rebounding team than Oregon during the regular season. In our view, the only way Virginia loses this spread is if they consistently beat themselves this game. We don’t see it happening in this matchup. As far as our second bet, for Auburn to win, they need to create a lot of turnovers and knock down open 3s. Auburn took advantage of New Mexico St. and Kansas’s propensity to turn the ball over, but North Carolina is much better at taking care of the ball than those two. Finally, while NC does allow a lot of 3PT attempts per game, they allow less than 33% of three pointers to go in. As far as other matchups, North Carolina ranks higher than Auburn in just about every advanced offensive and defensive metric, as well as coaching. For example, Auburn is ranked lower (#45) in advanced defensive efficiency than most of the teams left in the tournament, but where they are absolutely terrible at is allowing offensive rebounds. On the other side, NC is a top 25 in the nation in offensive rebounds; Auburn showcases a measly #330 in offensive rebounds allowed. Finally, since NC is in the 99th percentile of teams in terms of FG% at the rim, we see a lot of high percentage buckets for NC. Combine that with ranking as one of the top teams in the nation in transition, and we see NC covering a 5 point spread from a whole number of different game scenarios. Best of luck to all those betting this weekend! Special thanks to @matteise for compiling the data used in this analysis. Check out our #7 vs. #10 first round analysis here. Nowadays, it seems like there’s too many advanced stats developed everyday. NCAA basketball is no different. You have sites such as KenPom and RPI, among others that crunch data to give insights as to who truly are the best teams in the nation. Now that Vegas released the spreads and O/U for just about every tournament matchup, let’s take a look at what we believe are the most interesting historical trends that have developed in March Madness from a betting perspective. After looking at this, we’ll give a prediction of our safest bet of the four first round matchups with these seedings. In the last five years, the #8 team is 11-9 ATS. UCF is the lone #9 team favored vs. VCU. When the #9 team is favored, the #8 team goes 19-9 ATS. In addition, the #8 team’s record ATS is 11-1 if the #8 team has a better KenPom ranking than their #9 opponent. If a #8 team from a Mid-Major Conference plays a #9 team from Power Conference, the #8 team is 6-4 ATS. Utah State/Washington is the only game with this criteria. The #8 team is 2-15 ATS when trailing at halftime. The O/U record for the last five years is 12-8. If you take a look at the following charts, you’ll see that Utah State bests Washington in just about every category besides adjusted defensive efficiency. 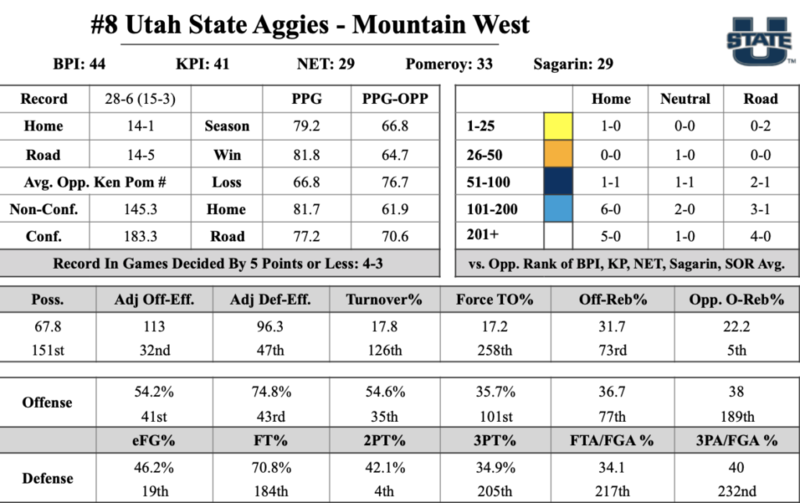 Some glaring advantages that I think Utah State will utilize are on the glass. Washington is #343 (!!) in offensive rebounds allowed per possessions. Also, Washington is outside the top 100 in offensive efficiency, whereas Utah State, for example, is #2 in 2PT % allowed. The final stat to look at is FT %. In any close game, the team with the free throw advantage wins. Utah State cracks the top 50; Washington doesn’t even crack the top 200. We think this advantage is enough for Utah State to win and cover. Thus, we believe that this is the safest bet out of these first round matchups. Special thanks to @matteise for compiling the data used in this analysis. Check out our #6 vs. #11 first round analysis here. In the last five years, the #7 team is 12-8 ATS. This includes 3-1 records each of the last two years. Wofford/Seton Hall carries a 145 O/U. When the O/U is set at 140 or more points, the #7 team is 9-14 ATS. Nevada vs. Florida O/U was set at 134. When the O/U is set at 135 or fewer points, the #7 team is 19-5-2 ATS. When the #7 team has BOTH an adjusted offensive and defensive efficiency ranking of 75 or better, #7 team is 19-10-1 ATS. Both Wofford and Louisville fit this criteria. Minnesota, Seton Hall, and Florida have BOTH a 2PT FG% and 3PT FG% ranking of 75 or lower. When a #10 team has BOTH a 2PT FG% and 3PT FG% ranking of 75 or worse, the #7 team is 18-12-1 ATS. In the last five years, the O/U record is 13-7. This includes 3-1 records each of the last two years. When the #7 team has BOTH an adjusted offensive and defensive efficiency ranking of 75 or better, the O/U is 19-10-1 ATS. Both Wofford and Louisville fit this criteria. Wofford/Seton Hall carries a 145 O/U. When the O/U is set at 140 or more points, the O/U record is 11-12. Nevada vs. Florida O/U was set at 134. When the O/U is set at 135 or fewer points, the #7 team is 13-12-1. When the #7 team is favored by 4 or more points, the O/U is 8-4. Wofford is 37 ranks above Seton Hall in overall KenPom ranking, the highest differential of the 7/10 matchups. They’re second in the nation in 3PT FG %, while Seton Hall ranks in the 200s in 3PT attempts allowed as a percentage of total attempts. We think this advantage is enough for Wofford to win and cover. Thus, we believe that this is the safest bet out of these first round matchups. Special thanks to @matteise for compiling the data used in this analysis. Check out our #5 vs. #12 first round analysis here. In the last five years, the #6 team is 6-14 ATS, including 1-3 records each of the last three years. When the #6 team is favored by 5.5 or more points, the #6 team is 6-10 ATS. Iowa State is the lone #6 team favored by 5.5 points. If a #6 team from a Mid-Major conference plays a #11 team from a Power Conference, the #6 team is 1-14 (!!) ATS. Buffalo/Arizona State fits this criteria. If a #6 team from a Power Conference goes against a #11 team from a Mid-Major Conference, the #6 team is 2-10 ATS since 2010. However, one of those wins came last year. Will Villanova and Maryland buck this trend? When a #6 team from a Power Conference goes against a #11 team from a Power Conference, the #6 team is 11-8 ATS. Iowa State/Ohio State is the only matchup that fits here. In the last five years, the O/U record is 6-14, including 0-4 in 2015 and 2018. When the #6 team is favored by 5.5 or more points, the O/U is 6-10. If the #6 team is favored by 2.5 or fewer points, the O/U record comes out to 4-10-1. When the O/U is set at no more than 130 points, the the O/U record is 9-12. If the #5 team scores 74 or fewer points, the O/U is 7-27-1. Yes, Belmont has a top 5 offense in terms of efficient FG % and 2PT FG%. They have a top 20 adjusted offensive efficiency ranking due in large part to the fact over 90% of their 2PT shots this season were in the paint and/or at the rim. However, they’ve only played one game this season against a team with anywhere similar defensive and tempo numbers as Maryland; against Purdue. Belmont lost that game 73-62. Purdue has adjusted offensive efficiency, adjusted defensive efficiency rankings of #5 and #31. Maryland ranks #27 for the former and #22 for the latter. Similar to Purdue, Maryland ranks as one of the slowest tempo offenses in the nation. Most importantly, the Terrapins ranks in the top 20 in 2PT FG% allowed because they force their opponents to take long 2PT FGs. The last fact we want to point out is while Belmont’s leading scorer Dylan Windler is shooting 43% from 3 on the season, he’s only 12-50 in the five games against KenPom top 100 ranked opponents. So why aren’t we taking Maryland here? They are below average at finishing at the rim, they play one of the slowest tempo of basketball in the tournament, and they are one of the worst teams in protecting the ball from turnovers. The turnover battle could swing either way, which is another reason why we don’t know which spread bet is better. Belmont is top 20 at protecting the ball while Maryland is top 20 in forced turnovers. Conversely, Maryland turns the ball over at one of the highest percentage rates in the tournament, while Belmont is one of the weakest teams at forcing turnovers. Thus, we believe that the UNDER here is the safest bet out of these first round matchups. Special thanks to @matteise for compiling the data used in this analysis. Check out our #4 vs. #13 first round analysis here. #5 Auburn vs. #12 New Mexico St. In the last five years, the #5 team is 7-10-3 ATS, but went 3-0-1 ATS last year. When favored by 4 or fewer points, the #5 team is 10-13-1 ATS. Both Wisconsin and Marquette are favored by less than 4. When the #12 team has a 3PT FG% ranking of 50 or worse AND a defensive 2PT FG% ranking of 125 or worse, the #5 team is 12-5 straight up and 8-8-1 ATS. The only #12 team that meets the above criteria is Oregon. This seemingly favors Wisconsin due to the small spread. When the #5 team scored 75 or more points, the #5 team is 17-9-3 ATS, 3-0-1 last season. Auburn, Marquette, and Mississippi State all averaged over 75 PPG in Power 5 conferences. When the #5 team scored 74 or fewer points, the #5 team is 10-24-1 ATS. Wisconsin averages just under 70 PPG. In the last five years, the O/U record is 15-5, including 4-0 in 2016 and 2018. When the #5 team has a KenPom ranking that is no more than 30 ranking spots better than the #12 team, the O/U is 12-13-1. The Marquette/Murray State matchup fits this criteria. If the #5 team scores 75 or more points, the O/U is 27-2 (!!). When the #12 team scored 65 or more points, the O/U is 30-7-1. We’re going to qualify this by stating we’re a Wisconsin based startup and that we can see arguments for or against the spread for both the Wisconsin and Marquette games. And if you held a gun to our heads, we’d lean towards betting the OVER on both games instead of the spreads based on the matchups. But we’d prefer a safer play, and we believe the Auburn/New Mexico St. OVER is the safest of them all with their #8 and #37 rankings in adjusted offensive efficiency, respectively. Even better, both teams strengths on offense are perfect for the defensive weaknesses of both teams. Auburn is ranked #8 in 3PT attempts as a percentage of FG attempts and #27 in 3PT %. New Mexico State is ranked #105 in defensive 3PT % allowed. Conversely, New Mexico State is #9 in 2PT %, while Auburn is #192 in defensive 2PT % allowed. Thus, we believe that the OVER here is the safest bet out of these first round matchups. Special thanks to @matteise for compiling the data used in this analysis. Check out our #3 vs. #14 first round analysis here. Nowadays, it seems like there’s plenty of advanced stats developed everyday. NCAA basketball is no different. You have sites such as KenPom and RPI, among others that crunch data to give insights as to who truly are the best teams in the nation. In the last five years, the #4 team is 7-12-1 ATS, including a 0-4 record ATS last year. When favored by 10 or more points, the #4 team is 6-15-1 ATS. Virginia Tech is favored by 10.5 points. Conversely, when the #4 team has a KenPom ranking that is 85 ranking spots or better than the #13 team, the #4 team is 9-4-1 ATS. Also, when the #13 team has a KenPom ranking of 90 or worse, the #4 team is 13-7-1 ATS. Virginia Tech is ranked #11, while Saint Louis is ranked #104. When the #4 team scored 75 or more points, the #4 team is 22-8-1 ATS, but went 0-1 last season. Kansas averaged 75.4 PPG against the hardest adjusted strength of schedule according to KenPom. When the #4 Seed scored 74 or fewer points, the #4 team is 9-24 ATS. Kansas State has scored 75 or more points only FOUR times this season against an adjusted SOS ranking of #32. In the last five years, the O/U record is 9-11, including 0-4 in 2018. When the #4 team is favored by 10 or more points, the O/U is 9-13. Virginia Tech is favored by 10.5 points. When the #4 team scored 75 or more points, the O/U is 20-11. Kansas averaged 75.4 PPG against the hardest adjusted strength of schedule according to KenPom. When the #4 Seed scored 74 or fewer points, the O/U is 10-23. Kansas State has scored 75 or more points only FOUR times this season against an adjusted SOS ranking of #32. Florida State has scored at least 75 points only two out of their last ten games. When the #4 team scores 70 or more points, the O/U is 22-16. Conversely, when the #4 team scores 69 or less points, the O/U is 2-24. This line feels like an overreaction to the one advantage Northeastern has over Kansas; shooting from deep. Northeastern is in the top 20 in 3PT FG% and top 25 in 3PT shots as a percentage of overall attempts. Conversely, Kansas barely cracks the top 300 in 3PT shots allowed as a percentage of overall attempts. However, Kansas is just outside the top 100 in 3PT % allowed. Otherwise, Kansas is far superior in every other facet of the game in terms of talent, coaching, and advanced metrics. The individual talent and coaching speaks for itself, but Kansas is #15 in adjusted defensive efficiency and will dominate on the glass. Northeastern generally a lineup with 4 guards and one center, which has a lot to do with why they’re ranked #328 in the nation in offensive rebound percentage. Finally, Northeastern has played only two teams with top 25 adjusted defensive efficiency in Syracuse and Virginia Tech. In both those games, they lost by over 20 points. Thus, we believe that Kansas ATS is the safest bet out of these first round matchups. Special thanks to @matteise for compiling the data used in this analysis. Check out our #2 vs. #15 first round analysis here. Nowadays, it seems like there’s more and more advanced stats developed everyday. NCAA basketball is no different. You have sites such as KenPom and RPI, among others that crunch data to give insights as to who truly are the best teams in the nation. In the last five years, the #3 team is 8-12 ATS. In the last three years, the #3 team went 2-2. A #3 team with BOTH an adjusted offensive and defensive efficiency ranking of 40 or better is 16-5-1 ATS. Texas Tech (#35/#1), Purdue (#5/#32), and Houston (#23/#13) meet this criteria. When a #3 team has a KenPom ranking that is 100 spots or better than the #14 Seed, the #3 Seed is 10-6 ATS. Purdue (#10) vs. Old Dominion (#112) is the only matchup that qualifies here. A #3 team from a NON-POWER CONFERENCE (Houston) is 1-6-1 ATS. Also, the #3 team led by 5 or more points at halftime just twice and trailed at half the five other games. A #3 Seed with BOTH a defensive efficiency ranking and defensive 3 PT FG% of 50 or worse is 5-15–1 ATS. LSU (#62/#161) meets this criteria. In the last five years, the O/U record is 11-9, including 4-0 and 1-3 records in 2017 and 2018, respectively. When a #3 team is favored by 12 points or less, the O/U is 12-29. LSU/Yale opened at an O/U of 160 but has been trending down. A matchup where a #3 team with BOTH an adjusted offensive and defensive efficiency ranking of 40 or better has an O/U record of 6-16. Texas Tech (#35/#1), Purdue (#5/#32), and Houston (#23/#13) meet this criteria. When the #14 team scores 65 or more points, the O/U is 18-7. Conversely, when the #14 team scores 60 or less points, the O/U is 3-30. When the #3 team scores 70 or more points, the O/U is 22-16. Conversely, when the #3 team scores 69 or less points, the O/U is 2-24. This one was tough. We also like the Under at 126 for the Purdue/Old Dominion game, as well as Yale +7.5. Unfortunately, we find one too many scenarios that could happen where these bets would lose. We like the Red Raiders to put the clamps down on Northern Kentucky and frustrate the Norse offense based on the advanced metrics of the matchup. Texas Tech has won 7 of their last 9 by double digits, with the average margin of victory to be 18.8 points. The Norse have faced only two top 100 teams all year and lost both matchups by double digits. Even worse, the Norse free throw percentage doesn’t even crack the top 300! Come tournament time, poor free throw shooting is an easy way to throw away a game. Thus, we believe that Texas Tech is the safest bet out of these matchups. Special thanks to @matteise for compiling the data used in this analysis. In the last five years, the #2 team is 10-9-1 ATS, including 3-1 records in 2014 and 2018. A #2 team with an adjusted tempo rank of 200 or slower & an adjusted defensive efficiency ranking of 50 or better (KenPom) is 12-6-1 ATS. Both Michigan (#320/#2) and Kentucky (#265/#11) meet this criteria. When a #15 team scores 65 or fewer points, the #2 team is 28-15-1 ATS, 24-8 ATS when 60 or fewer points. The #2 team that has an adjusted defensive efficiency ranking of 10 or better is 3-10 ATS. Michigan (#2) and Michigan State (#8) meet this criteria. However, Cincinnati bucked this trend in 2018. With the #1 ADJ DEF EFF ranking, they beat Georgia State 68-53 and also beat the -14 point spread. In 13 games against a non-#1 Seed, Big Sky teams (Montana) allow 75.5 points per game, while scoring 58.8 points per game. Going back to 2005 tournament, Big Sky teams have scored 60 or more points only three times and are 4-11-1 ATS. In the last five years, the O/U record is 7-13, including 0-4 records in 2014 and 2018. When the O/U is set at 145 points or higher, the O/U is 2-14. In these games, the average points scored is 146.5. Tennessee/Colgate opened at an O/U of 150 but has been trending down. The average number of points scored by a #2 seed in the first round over the past three years is 81.6. The average number of points scored by a #15 seed in the first round over the past three years is 65.1. When the #2 seed wins and covers the spread, the O/U is 9-21. When the #2 seed wins by 15 or more points, the O/U is 14-27. Here’s a bonus stat that’ll blow your mind. A #2 team with a 2PT FG% ranking of 50 or better AND a 3PT FG% ranking of 150 or better, AND when the #15 Seed has a defensive 2PT FG% ranking of 125 or worse, the #2 team is 13-0 straight up, 10-3 ATS, and the O/U is 3-10. Tennessee is ranked #18 in 2PT FG% and #89 in 3PT FG%. Colgate is ranked #187 in defensive 2PT FG%. Now, you may be tempted to bet on Tennessee to cover the spread, and we wouldn’t blame you if you did. However, Colgate has played two teams in the top #100 this season; Syracuse (#31) and Penn State (#54). They lost to Syracuse 77-56 and lost to Penn State 76-65. Thus, we believe the UNDER is the safest bet out of these matchups.